The menu this week is packed full of flavor. Lots of curry and ginger, two of my favorites! I love, love, love when I get a bite of fresh ginger in my soup, you will see what I mean! DON’T let the word BEETS scare you….YES I have been told they taste like dirt, I prefer earthy, but they are delicious and good for you. I should mention here that red beets turn your poo red, so no you do not have a bleeding disorder, it’s just the beets. If the boldness of red beets scare you try the golden beets, they are sweeter and a good place to start if you just cannot stand beets. 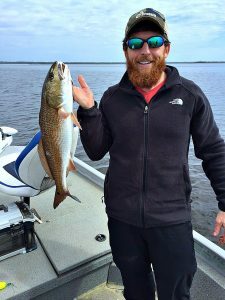 Josh, my husband, went fishing this weekend at Keaton Beach with some friends and caught some pretty red fish and trout. We are going to cook the redfish and freeze the trout for later. You can opt for any lean meat here because the side dish is a bit fatty. Now remember I modify my meals to feed two very hungry adults for lunch and supper all week, according to OUR macros. This means I am doubling every recipe so we can have leftovers for lunch the next day. We grocery shop and cook/prep all the meals on Sunday. If Sunday is not a good day for you, pick a different day! It is all about what is convenient for you. Meal prep does not mean you have to cook it all at one time either. You could simply cook parts of the meal, chop the veggies before hand, marinate the meat, etc. It is all about making your meals easier to prepare and easier to make smart, healthy choices. Taking the time to do this will cut out the temptation of fast food and take out the guess work in calculating your macros. You can just copy your meal from the night before onto your lunch! If you have not figured out your macros, stop what you are doing and go do it! Reach out to Elev8 Crossfit if you live in or near Moultrie, GA and get a specific macro goal or refer back to my first post and take a stab at it! All of my recipes can be found on my Pinterest board For the love of food, except for those that I have created on a whim. Do not forget to print out your grocery list so nothing is forgotten! PSA: I make recipes for all of my dishes on mymacros app. (Remember you can follow me by searching jacqumeister and copy my recipes to get you started!) Make sure that you scan the packages of the ingredients you are using as you cook, this will avoid you digging in the trash to find the barcode or having to guess at which rice you should be using. We grilled the fish and asparagus, but you can certainly cook both in the oven or on the stove top. We seasoned the fish with salt, smoked paprika, and a few red pepper flakes. Combined 1/4th a cup of melted butter, garlic, and one lemon and topped the fish with it. Very simple and flavorful dish. This salad calls for a dressing and honestly it does not need it, IF you cook your eggs properly. Without the dressing your eggs need to be very runny. I eat one egg and Josh eats two. I also do not use the hazelnuts. This salad is one of our favorites to eat and very low maintenance to cook. Remember to weigh out your bacon and count your asparagus for your macros! This recipe calls for ground pork but I use 80/20 ground beef. There is no sense in buying a bag of large carrots, buy the pre-sliced carrots to save you time in the kitchen. The hoisin sauce is a MUST and I use much more than is recommended here. It really gives the dish the perfect flavor. Hoisin sauce must be mixed with water. This is a trial and error mixing, I like for my sauce to be thin so a little bit will go a long way and I do not get stuck with too many extra carbs or fat that are not beneficial. This dish calls for jasmine rice, do not skip the rice, it is delicious & this recipe needs it. When you scan the barcode it will bring up one cup DRY. The recipe calls for one cup PREPARED. Make sure you enter in the correct amount that you are using. One cup dry will make about 3 cups prepared. If you can afford all 3 cups in the dish go for it, but even though I double everything else, I keep the rice at 1 cup so I do not blow my carbs on one meal. Once your food is cooked, you already have the recipe in your app and can then separate it into the appropriate servings for you! I prefer to get a pork loin and cut my own chops, throw them in the oven at 425 for about 8-10 minutes or until the internal temp is around 140. Beets can be cooked several ways, but for me the easiest way I have found is boiling them. Simply cut the beet off the stem, wash the dirt off, and place into a pot with water at least an inch above your beets. Boil the beets until you can stick a metal skewer through the center. I love boiling my beets because they can stay on the stove as long as there is water in the pot. True story, I have actually left the beets on so long that the water completely evaporated and I had black crusted beets. Good news, they were still edible, just a lot smaller and I burnt the pot. Once the beets have cooked all the way through, let them cool or run them under some cold water to cool them down. Simply rub the skin and ‘tail’ off of the beets under running water and you are done! This salad is one I just threw together one day and I love it. I would suggest cooking the beets and cutting the watermelon prior to putting this salad together. Do not make this salad before eating it, but make sure to prep for it for a quick fix. Cook beets accordingly, chop to desired size for the salad and measure out 1 cup per serving. We opted to buy a whole watermelon, but buying pre-cut watermelon will save you time. Combine beets, watermelon, tomatoes. Toss in 1 Tablespoon of balsamic vinegar, weigh out the feta and top with basil. Enjoy! THIS SOUP Y’ALL…I cannot cook it enough. It is the simplest, most flavorful soup I have EVER cooked and I love trying new soups. This soup has rice noodles. They are a bit thicker than regular noodles and more chewy but they soak up the flavor and do not kill my macros. I could eat this entire pot of soup by myself. No joke. This recipe calls for 6 cups of broth and 1 can of coconut milk. I opt for 4 cups of broth and you can use a mixture of vegetable and chicken, it does not change the taste of the dish, and 1 can of light coconut milk. If your macros allow for more fat then I recommend the full fat. It makes the dish a lot thicker and its less of a “soup”. If you want it more soupy just use all 6 cups of broth but make sure to adjust your macros. I used a rotisserie chicken the first few times I cooked, but that became difficult to fit into my macros. I tried shrimp, but it did not give me enough protein and now opt to cook chicken breast instead. When I measure out this dish I use a slotted spoon and weigh out exactly 4 equal servings of noodles and kale, then add the broth so I do not have one bowl more broth(y) and one with more noodles. Then top with my desired amount of chicken and cilantro. This recipe also mentions several different toppings, the only topping I have used cilantro. Mix it up and let me know what you think! This can be a veggie option and the meat is totally interchangeable. I usually cook tilapia with this dish, but really just wanted some steak to go with it. This meal is very easy to prep and the ‘fixings’ keep for a while in the fridge so no rush to eat this first thing. With this meal it would make sense to cook the meat the night of, so that it is fresh and you could marinate it. I would pick fish or a thin steak just to cut down on cooking time the night of. I use a specific brand of tortillas that do not contain a lot of carbs, that way I am not fasting for one taco. I will usually only eat one tortilla and then just go back for seconds of meat and toppings only. This dish is going to be more carb heavy because of the beans so do not over do it on the carbs throughout the day when you plan to eat this one! Don’t forget to print your grocery list!